“Solo Violinist” is a 16 x 20” x 2" figurative painting on cradled board. It is a mixed media painting done with acrylic & oil paint, charcoal, and lace, rice & decorative papers. The painting comes wired and ready to hang, no frame needed, as it is 2 inches deep and painted black on all sides. I am often inspired to paint musicians because my husband is a musician and so am I. When things are going right for musicians, they are very much in the zone, an ideal state of mind for making music and art; it is full immersion, a Zen like connection with the activity without thinking about anything else. This violin soloist is definitely in the zone. 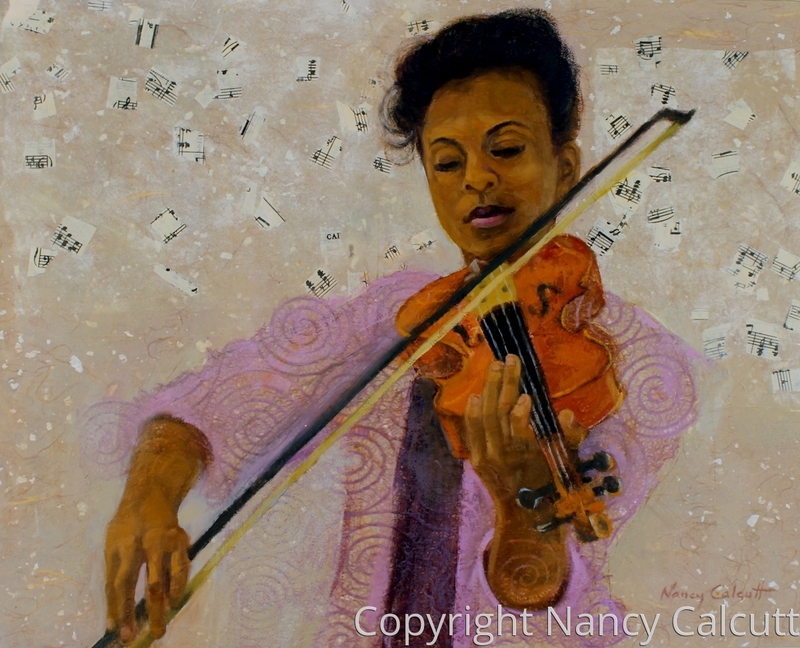 This painting features an African American woman performing a violin solo. What attracted me to her was her intense focus and expression and the body language between herself and her instrument. I love the pose, the interaction of diagonal and curved shapes and lines, and the energy of her bowing. Her hands are gorgeous and her violin is a work of art in itself. Some of the particulars that make this painting stand out are the collaged elements that are part of the piece. The lace, confetti and rice paper collaged onto the painting create an actual texture that is difficult to fully appreciate from a photo of the painting. The piece has to be seen (and touched) to be appreciated. This painting started with a first layer of collaged rice paper with silver inclusions; then I sketched in the figure with vine charcoal. In the next step, I decided to collage some confetti music paper around the top part of the figure. The confetti paper has inclusions of actual sheet music. After that I painted the figure in acrylic then oil paint, later deciding that this graceful musician needed a lace jacket, at which point I collaged some lilac lace paper. OMG that really was the coup de gras…love the lilac lace jacket!! I was definitely in the zone when I thought of that idea! The painting is finished with a couple of layers of wax varnish, which protects it from harm. The painting can also be buffed or cleaned with a soft white cloth.